The deposit books of Anglo Irish Bank and Irish Nationwide are sold off to state-owned AIB and to Irish Life & Permanent. THE DEPARTMENT OF FINANCE has confirmed that AIB and Irish Life & Permanent have been the two successful bidders for the deposit books of two state-owned banks worth around €14bn. 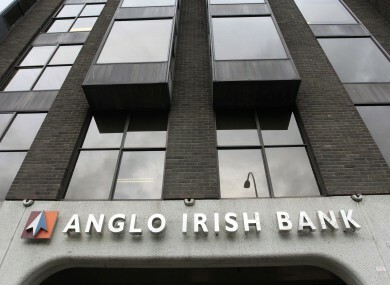 AIB will take over the loan book of Anglo Irish Bank, while Irish Life & Permanent will take on the outstanding deposits of Irish Nationwide Building Society. Both Anglo and Irish Nationwide had been taken into public ownership during the banking crisis of 2008, and the decision to auction them off came on foot of a High Court blessing for the Minister for Finance to seek to move the deposits elsewhere as part of the gradual winding down of both institutions, under the terms of the Credit Institutions (Stabilisation) Act passed late last year. The transfer of the loan books was finalised in the High Court earlier today, and confirmed by the Department of Finance this evening. A Department of Finance statement said the transfer was “necessary to ensure that both Anglo and INBS are in a position to continue the process for their restructuring” under the terms agreed with the EU and IMF. It added that no action was required on the part of depositors in either bank, and that the position of the deposits in all the institutions involved remained guaranteed. A number of employees will move to the acquiring banks as part of the deal, in order to ensure ease of transition for depositors. The Department offered no indication of the terms of the successful auction bids. Reports earlier in the week suggested that state-owned EBS and Bank of Ireland, as well as a number of overseas institutions, were among the other bidders seeking to acquire the deposit books. Email “AIB, Irish Life &amp; Permanent win €14 billion deposit auction”. Feedback on “AIB, Irish Life &amp; Permanent win €14 billion deposit auction”.